**Pressing enter while you're editing your blog title POSTS YOUR POST rather than going to the next line. Hence, why this posted when I wasn't quite ready. Dangit. I spent last weekend in Autuagaville, Alabama. Favorite Past Time of Autaugaville Residents: Alabama/Auburn Rivalries, Drinking Sweet Tea and watching High School Football. I love it there. It's a completely different world of deep Southern accents, slow paced folks and extended cab pick up trucks. I was invited down south to help one of my dear college friends with the house she and her sister just moved into. They live on a large piece of land where cotton grows. Their parents and grandmother all live on the same piece of land. It's so Pioneer Woman of them. Here are the adorable sisters - Kim & Melinda. 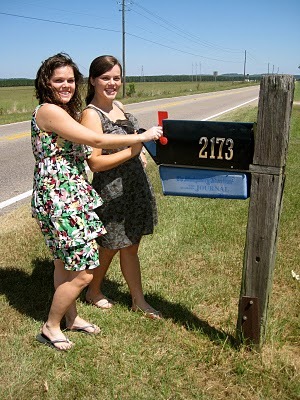 You get the idea of how far into the country we are - just look at the expanse of fields behind their mailbox! 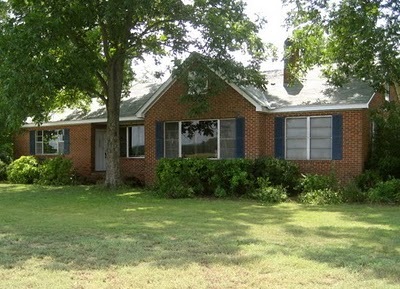 And here's our project - their house! Stay tuned to read about our flea market finds and thrifty home overhaul! Can't help but think, War Eagle! when I see those cute blue shutters.